A young Khmer Rouge fighter (left) and Cambodian refugees both photos featured in the photo exhibition by Pierre Toutain-Dorbec. French photojournalist Pierre Toutain-Dorbec's work contrasts life in Khmer Rouge commando camps with refugee camps along the Thailand border. An exhibition showcasing 35 black-and-white photographs taken in 1979-80 by French photographer Pierre Toutain-Dorbec opens today at Phnom Penh's Bophana Audiovisual Resource Centre. Presented in collaboration with the Human Rights Centre at the University of California, Berkeley, and funded by the Open Society Justice Initiative, Confronting the Past: The Aftermath of the Khmer Rouge Regime provides a singular close-up of life at a Khmer Rouge commando camp, as well as rare insights into the initial refugee flows across the border to Thailand. Toutain-Dorbec, who will not be present for the exhibition, worked as a photojournalist in Cambodia when the pictures were taken. He isn't quite sure how he managed to get so close to the Khmer Rouge during such a tumultuous time. "I think the real question is why they let me go with them. I have no answer, sorry," he wrote in an email. "Pictures of the Khmer Rouge were taken leisurely at a Khmer Rouge camp inside Cambodia, where they were sleeping, and making ... arms like punji or landmines. It is an intentional juxtaposition because it was like that. All those events were happening at the same time, in [the] same period, at more or less the same place (inside Cambodia or along the Thai border)." Surprisingly, Toutain-Dorbec's photographs have never been showcased in Cambodia. In fact, it was rather by chance that they come to be exhibited this time, too. Patrick Vinck, director of the Initiative for Vulnerable Populations at the Human Rights Centre at Berkeley, explains how he happened to meet Toutain-Dorbec while doing research for his centre's Cambodia project. "[Toutain-Dorbec] told us about his experience in Cambodia as a photojournalist in the mid-'70s and early ‘80s. ... We saw his pictures and we thought they were amazing. Also, they had never been shown here in Cambodia," he said. "We thought they provided a somewhat unusual perspective, in the sense that I think there have been quite a few pictures of the conflict itself and what happened during the Khmer Rouge regime, but very little about the late ‘70s and the refugee movements, especially across to Thailand, and what the life of those refugees was like," he continued. The artist himself hopes the exhibition will help Cambodians face their past.
" I think the real question is why [the khmer rouge] let me go with them. I have no answer, sorry." "A genocide has been committed, so like many people concerned by human rights [and] peace, I try to speak clear and loud. That is because I think that silence is not a good answer after a genocide. A way to avoid other genocides in the future is, maybe, to talk about previous genocides," he wrote. "Through this exhibition, I want to say never again." Vinck reasons along similar lines. "The commonality between our research project and Pierre's pictures, we felt, is this process of looking back to what happened and how was that period, and at the same time looking forward to the future; how knowing what happened and admitting what happened and taking accountability for what happened contributes to [post-conflict] reconstruction," he said. The exhibition and his centre's research project are complementary, he said. "Art can bring emotions that a dry, scientific report cannot do. It is a more graphic and direct representation. You see things. It draws you in. You can spend 10 minutes looking at a picture, and it echoes something you can relate to," he said. Photographs of the Khmer Rouge featured in the exhibition include close-ups of child soldiers with guns, war-elephant patrols and soldiers seemingly on the run. "The mood in the camp was extremely sad, a deep sadness. The feeling was reinforced by the fact that most [Khmer Rouge soldiers] were looking at the future without any hope. They were like people with no future," Toutain-Dorbec wrote. In contrast, photos from the refugee camps, though sharing a deep sense of sadness and despair, also offer a glimmer of hope. Smiling recipients of international aid, women giving birth and humanitarian aid workers performing surgery all echo an anticipation of a future life and a transition towards peace. Yet simultaneously, arresting portraits of survivors-turned-refugees reveal the pain and suffering inherent in their bleak situation. "Confronting the Past: The Aftermath of The Khmer Rouge" opens tonight at Bophana Audiovisual Resource Centre and will run for one month. The Human Rights Centre's report, So We Will Never Forget: A Population-based Survey on Attitudes About Social Reconstruction and the Extraordinary Chambers in the Courts of Cambodia (ECCC)" was made public yesterday. FAIRFIELD resident Leigh Mathews has been named Victoria’s 2009 Young Australian of the Year for her dedication to improving the lives of Cambodian children. Devastated by the conditions she saw while teaching English in a Cambodian village in 2004, the then 23-year-old felt compelled to do something to help. “I couldn’t just leave without trying,” Ms Mathews said. She spent six months volunteering with local organisations, looking at what medical and social services there were for the displaced children, street kids and families. She formed the Future Cambodia Fund, a charity developing projects to improve education and health, including a street kids clinic and water sanitation for communities who had no access to clean water. “Many people are dying from treatable and preventable diseases,” Ms Mathews said. On top of her full-time job at a women’s crisis centre, Ms Mathews, now aged 27, works seven days a week with other volunteers, fundraising and organising projects with help from charity organisations in Cambodia. Ms Mathews is now a candidate for the Young Australian of the Year, which will be announced on Australia Day 2009. She hopes that her Victorian award will bring attention to the plight of displaced children around the world, and motivate other young people to make a difference. “I really hope this award can inspire young people who see injustice in the world to believe they can do something about it,” Ms Mathews said. The government must lower the reserve rate of banks so that financial institutions can loan more money and fuel the economy in the grips of a financial slowdown, national media reported on Thursday. The National Bank of Cambodia, in an attempt to lower inflation and cool the lending market, began requiring in May 2008 that banks double their reserves from 8 to 16 percent of all their foreign currency. "Inflation is coming down particularly in food and energy costs(since December 2008) and now the danger is the economy slowing down, so at some stage (the government) might relax some of its policies on credit squeezing," English-Khmer language newspaper the Cambodia Daily quoted John Brinsden, vice president of the Acleda Bank, as saying. The reserve rate has significantly cut Acleda's ability to issue loans, he said, adding that outstanding loans at Acleda grew just 5 percent in the last six months of 2008 after the central bank doubled the reserve rate. Prior to that, in the first six months of 2008, outstanding loans at Acleda grew 50 percent to more than 450 million U.S. dollars, he said. "We just do not have the funds we would like (available)," he added. The Cambodian economy enjoyed double-digit increase during the 2005-2007 period, but down to below 10 percent in 2008 and will further slide to around 5 percent in 2009, according to the forecasts by experts and international financial institutions. PHNOM PENH (AFP) — Cambodia's opposition leader Thursday urged US President Barack Obama to help find the killers of a prominent union boss, as hundreds of people gathered to mark five years since his murder. Chea Vichea, who headed the country's largest labour union and was a vocal critic of Prime Minister Hun Sen's government, was gunned down at a Phnom Penh newsstand on January 22, 2004. The daylight murder shocked Cambodia and badly fractured the country's nascent workers' movement. It was condemned by rights groups as a brutal attempt to silence opposition-linked unions. "I beg US President Barack Obama to help Cambodian people find the criminals to bring them to justice," opposition leader Sam Rainsy told a crowd Thursday at the spot where Chea Vichea was shot. 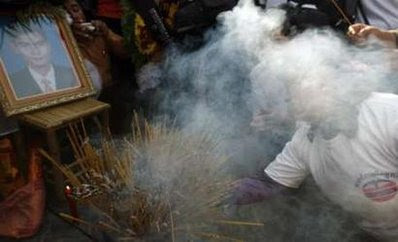 The politician marched through Phnom Penh with some 300 garment workers and unionists to place wreaths and light incense sticks at the newsstand. Sam Rainsy criticised authorities for failing to arrest the real culprits, but said he hoped that a "push from outside" would bring "change" in the case of Chea Vichea's murder over the next year. Cambodia's highest court late last month provisionally released two men convicted of killing Chea Vichea and ordered the case to be re-tried, citing unclear evidence. The two men, Born Samnang and Sok Sam Oeun, had been arrested just days after the union chief's 2004 death, convicted of murder and quickly sentenced to 20 years each in prison. The United States and UN welcomed the decision by the court to order a retrial. International and local rights watchdogs had called the conviction and trial deeply flawed and said the true perpetrators remained at large. But two other labour leaders have also been murdered since Chea Vichea's killing, in an escalation of attacks against workers' rights advocates. Their deaths cast a pall over Cambodia's key garment industry, with several major clothing labels warning the government that swift justice was needed for their continued presence in the country. PHNOM PENH, Jan. 22 (Xinhua) -- Cambodian Prime Minister Hun Sen has warned that the recent alliance of two main opposition parties will not last, national media reported on Thursday. The Sam Rainsy Party (SRP) and the Human Rights Party (HRP), which are two main opposition parties in the Cambodian National Assembly (NA), agreed last week in principle to establish a political alliance called the Democratic Movement of Change (DMC) for the upcoming elections. "When I want (the alliance) to separate, they will be separated," English-language newspaper the Phnom Penh Post quoted the premier as saying on Tuesday in Oddar Meanchey province. "I would like to tell you that now one-third of their members have defected to the Cambodian People's Party (CPP)," he said. Hun Sen belongs to CPP, which is the major ruling party. "I am never scared of these mergers. Do not say that an alliance will cause CPP to fall," he added. The DMC is a new political force to lead and advance the country to have prosperity, according to the joint statement issued by both parties. The upcoming elections include the 2012 commune councils election and the 2013 general election. "Our candidates will be registered to represent only one party in polling constituency," SRP president Sam Rainsy and HRP president Kem Sokha told reporters at a press conference. "We will walk on the non-violent and legal strategies for political actions," Sam Rainsy said, adding that the movement does not oppose any individual or parties. Meanwhile, Khem Sokha appealed to intellectuals and democratic supporters to join the DMC for upcoming elections. In last year's general election, CPP won some 90 seats, SRP 26 and HRP 3 in all the 123 seats in NA. (New York, January 21, 2009) – The Vietnamese government should immediately free Khmer Krom Buddhist monks and land rights activists in prison or under house arrest for the peaceful expression of their political and religious beliefs, Human Rights Watch said in a report released today. The Khmer Krom is a large ethnic group in the Mekong Delta that is central to Vietnam-Cambodia relations. The 125-page report, “On the Margins: Rights Abuses of Ethnic Khmer in Vietnam’s Mekong Delta,” documents ongoing violations of the rights of the Khmer Krom in southern Vietnam and also abuses in Cambodia against Khmer Krom who have fled there for refuge. Wary about possible Khmer Krom nationalist aspirations, Vietnam has suppressed peaceful expressions of dissent and banned Khmer Krom human rights publications. It also tightly controls the Theravada Buddhism practiced by the Khmer Krom, who see this form of Buddhism as the foundation of their distinct culture and ethnic identity. Drawing on detailed interviews with witnesses in both Vietnam and Cambodia, the report shows that Khmer Krom in Vietnam face serious restrictions on freedom of expression, assembly, association, information, and movement. In researching this report, Human Rights Watch came into possession of internal memos circulated by the Communist Party of Vietnam and Vietnamese government officials outlining their concerns about unrest among Khmer Krom in the Mekong Delta and strategies to monitor, infiltrate, and silence Khmer Krom activists. The documents are included in an appendix to the report. “On the Margins” provides a rare, in-depth account of a protest conducted by 200 Khmer Krom Buddhist monks in Soc Trang province, Vietnam, in February 2007. Protesters called for greater religious freedom and more Khmer-language education. Although the protest was peaceful and lasted only a few hours, the Vietnamese government responded harshly. Police surrounded the pagodas of monks suspected of leading the protest. Local authorities and government-appointed Buddhist officials subsequently expelled at least 20 monks from the monkhood, forcing them to defrock and give up their monks’ robes, and banishing them from their pagodas. The authorities sent the monks back to their home villages and put them under house arrest or police detention, without issuing arrest warrants or specifying the charges against them. During interrogations, police beat some of the monks. In May 2007, the Soc Trang provincial court convicted five of the monks on charges of “disrupting traffic” and sentenced them to two to four years of imprisonment. Some of the monks were beaten during interrogation. After the demonstrations, the authorities instituted stricter surveillance of Khmer Krom activists, restricted and monitored their movements, banned their publications, and monitored their telephones. The report also examines rights abuses of Khmer Krom who have moved to Cambodia, where they remain among Cambodia’s most disenfranchised groups. Because they are often perceived as ethnic Vietnamese by Cambodians, many Khmer Krom in Cambodia face social and economic discrimination and unnecessary hurdles to legalizing their status. The Cambodian government has repeatedly stated that it considers the Khmer Krom to be Cambodian citizens. Yet the Cambodian authorities often react harshly when Khmer Krom become too critical of the Vietnamese government, a close ally of the Cambodian government. In 2007, Cambodian police forcefully dispersed a series of protests in Phnom Penh by Khmer Krom monks denouncing the rights abuses they had experienced in Vietnam. In February 2007, a Khmer Krom monk, Eang Sok Thoeun, was killed in suspicious circumstances after he participated in a protest in Phnom Penh. In June 2007, Cambodian authorities arrested, defrocked, and deported to Vietnam a Khmer Krom activist monk, Tim Sakhorn, who was sentenced in Vietnam to a year in prison. 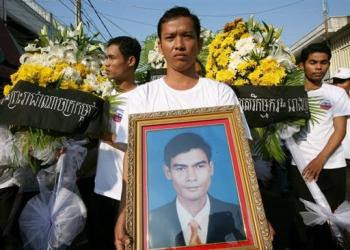 Human Rights Watch called on the Cambodian government to investigate thoroughly the killing of Eang Sok Thoeun, and on the Vietnamese government to allow Tim Sakhorn, placed under house arrest in Vietnam after his release from prison in May 2008, to return to his home in Cambodia if he chooses. All names in quotation marks in the report are pseudonyms to protect interviewees from government reprisals. The Vietnamese Embassy in Cambodia held a get-together for Vietnamese nationals in Phnom Penh on January 21 to celebrate the traditional Lunar New Year (Tet) festival. The event was also attended by Var Kim Hong, senior minister and chairman of the Cambodian Committee for Border Affairs, and Long Visalo, Secretary of State of the Ministry of Foreign Affairs, as well as the Lao and Cuban ambassadors to Cambodia. Addressing the function, ambassador Nguyen Chien Thang extended New Year Greetings to all the Vietnamese community in Cambodia. He affirmed that the community is an indispensable part of the Vietnamese nation, and called Vietnamese nationals to work harder to further strengthen the traditional friendship between the two neighbouring nations. He also thanked the Cambodian Government for creating favourable conditions for Vietnamese nationals to integrate well into the local community. Hosts and guests raised toasts and enjoyed a special performance given by Vietnamese artists from Military Zone No7. Earlier on January 20, ambassador Thang paid a pre-Tet visit and presented 100 gifts to Vietnamese nationals residing in Preh Tateng commune of Kandal province. On this occasion, embassy officials and representatives from the Army-run Telecommunication Company (Viettel) presented more than 400 Tet gifts to the Vietnamese in Phnom Penh and Kompong Chhnang province. “Phnom Penh: The meltdown of the global economy, the lack of trust from investors, the lack of skills, the weakness of laws and of the judicial system, and corruption are considered by experts to be obstacles against the expected success of a stock market in Cambodia. This assessment is made as Cambodia plans to start the process of its first stock market in December 2009. “It should be noted that a stock market is a gathering forum which allows investors and the general people to invest in companies that they trust, in order bring back profits for them. Those companies participating in a stock market can sell their shares to anybody and take the money like a loan for extending their activities, expecting profit; citizens can buy shares in order to become shareholders and co-owners of a shares selling company. Such clients can receive benefits, as long as the company makes profit. “At present, the global economy is facing a crisis, and the stock markets of all countries are low, because many owners of shares sold their shares in order to recoup [as much as is left of their] original capital, and many other potential customers give up their intentions to invest in the stock market. “The Chief Researcher of the Cambodian Institute for Cooperation and Peace, Mr. Chab Sothearith, said that the general loss of trust from investors will make it difficult for a stock market in Cambodia to take off. “In should be noted that the Cambodian government announced a stock market project in September 2007 with Korea Exchange of South Korea, which put up 45% of the share capital as a partner immediately. After the announcement, the Cambodia Securities and Stock Exchange Law was adopted, and a Securities Commission of Cambodia was created, to encourage the creation of a stock exchange, which will issue shares and take action against companies that violate the law. “However, stock exchange experts said that Cambodia still has a lot of shortcomings which are an obstacle for the progress of starting a stock exchange at the end of this year. “An advisor of the National Accounting Council and finance professor of the Royal University of Economy and Law, Mr. Soum Chanthy, said that so far, Cambodia has very few stock market experts and does not have a proper and sufficiently complex technical basis to meet the operations of a stock market. “In addition, Cambodia needs a firm legal system and courts with high capabilities to quickly and justly solve issues related to doing business in a stock market. “Mr. Soum Chanthy added that although there is still one year left to create a stock market, Cambodia is not yet capable to meet all shortcomings mentioned above, making the stock market plan progress slowly. “The director of the Cambodia Institute of Development Studies, Mr. Kang Chandararoth, said that while Cambodia has not yet an anti-corruption law, the creation of a stock market will provide high hazards, and losses will have to be faced by investors. “The Cambodian government has not yet adopted an anti-corruption law for many years. “Mr. Kang Chandararath went on to say that corruption can happen at state and private companies, like hiding facts in financial reports about capital, losses, and profits. “It should be noted that part of success of a successful investment of capital depends on good governance and financial transparency of companies; their situation needs to be disclosed publicly; however, among more than 2,000 enterprises operating in Cambodia, less than 20% publish annual reports. This information comes from the National Accounting Council at the Ministry of Economy and Finance. “A secretary of state of the Ministry of Economy and Finance, Mr. Ngy Tayi, agreed with the definition of the problems mentioned above, and he said that at present, the Ministry continues to encourage different companies to organize their reports properly before they are allowed to participate in the stock market. In the meantime, the director of the general commercial development project of Korea Exchange, Mr. In Myo Lee [phonetic], said that a stock market can help to reduce corruption in Cambodia. MALAYSIA's Baker Tilly Monteiro Heng, one of only 21 approved international audit firms in Cambodia, says the kingdom's developing economy is a good investment destination amid the global economic downturn. "We are excited with the market potential in Cambodia. Our new office is launched to assist international corporations in the country," Baker Tilly executive partner Andrew Heng said in a statement. Baker Tilly partner Lock Peng Kuan added that investing in a developing market like Cambodia is a good strategy in view of the global economic slowdown. The Cambodian stock exchange is planning to launch in December 2009. The audit firm is hoping to capture a portion of the pre-IPO (initial public offering) transactions in the privatisation of enterprises as well as the international corporations, Lock said. 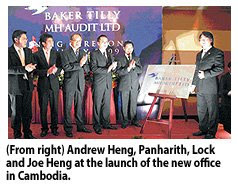 Baker Tilly's Phnom Penh office was launched last week. Hong Panharith, inspector-general to the Ministry of Foreign Affairs was the guest of honour. It was also attended by Bun Honn, the Ministry of Justice's secretary of state and Teh Sing, president of the Malaysia Business Council of Cambodia. Three Baker Tilly group partners - Heng, Lock and associate partner Joe Heng - have been admitted as certified public accountants and approved auditors with Kampuchea Institute of Certified Public Accountants and Auditors. "We hope Baker Tilly Monteiro Heng's presence would contribute to the growth of corporate governance in the Cambodian commercial sector and in the large economy," Panharith said. Since the early 1990s, Cambodia has enjoyed over a decade of high average economic growth at an average 7.1 per cent per annum, government officials said. This is driven largely by the construction and tourism sectors and, since the late 1990s, a rapidly emerging garment sector. Government officials said there is an increase in private investment in response to an improved investment climate, as government reforms begin to show results. Thailand's prime minister yesterday refused to grant U.N. experts access to 126 boat people from Myanmar, following allegations that the Thai army had left them to die on the open seas. Prime Minister Abhisit Vejjajiva dodged reporters' questions on a request from the United Nations refugee agency (UNHCR) to visit the group, and urged it instead to work with Thai authorities. "The agency should come and talk to us about how to work together. Our work together should be based on cooperation and appropriate rules," Abhisit told reporters. "They (the U.N.) should understand that every country has this problem (of refugees)," he said, adding that he wanted to discuss the matter with Myanmar. Late Tuesday, the UNHCR announced it had asked the Thai government for access to the refugees to assess their needs. Spokesman Ron Redmond said 80 of the migrants were being held on Koh Sai Daeng island off the Thai coast in the Andaman Sea. Another 46 have been handed over to the Thai military authorities with no further information on their current location, he said. Thailand's foreign ministry yesterday said it spoke with UNHCR frequently and may arrange a meeting with agency officials to discuss the matter further. Survivors and a human rights group have accused the Thai army and navy of detaining and beating up to 1,000 members of the Rohingya minority from Myanmar late last year, before towing them out to sea with little food and water. Nearly 650 of the Muslim Rohingya have been rescued in waters off India and Indonesia. Some of them told officials that they had been beaten in Thailand before being set adrift in barges with no engines or navigational equipment. The spokesman for Thailand's state security body, Colonel Thanatip Sawangsaeng, said Tuesday the case was being investigated. He added that the army chief had said that the military "followed international standards and adhered to humanitarian principles." Abhisit said he had requested further photo evidence and information from the navy on Thailand's routine treatment of illegal immigrants. Foreign ministry permanent secretary Virasakdi Futrakul said neighboring countries would be invited to a joint discussion on the Rohingya, describing them as a "regional problem." Cambodia. This award recognizes Dr. Thangsing's exemplary contribution and dedication towards humanitarian services rendered by him and the organization for the people living with HIV/AIDS and general public in Cambodia. The selfless and passionate mission has saved many lives and restores dignity and hope for many people infected and affected by the HIV/AIDS epidemic in Cambodia. The "Royal Order of Sahametrei" was conferred after a citation by His Excellency Professor Mam Bun Heng, The Honorable Minister of Health, on behalf of the Prime Minister, The Royal Government of Cambodia on Wednesday, January 21st, 2009. The Honorable Minister announced, "This is a big honor and my proud privilege to hand over the "Sahametrei' to you, to honor and recognize your selfless dedication and contribution to better the lives of our people." Accepting the award Dr. Chinkholal Thangsing said, "I am deeply honored and humbled for being awarded the prestigious "Royal Order of Sahametrei.' My heartfelt gratitude and thanks to the Royal Government of Cambodia - The Ministry of Health, National Center for HIV/AIDS, Dermatology and STI (NCHADS) AIDS Healthcare Foundation and to the highly committed wonderful AHF Cambodia Cares team for this tremendous, tremendous honor. This award is a tribute just not for me but to all those who willingly endeavor and risk their lives, energy, strength, wisdom and have the courage to fight for the underserved and unserved and for those who cannot do it themselves." Dr. Chinkholal Thangsing, MBBS, FCAMS, son of Mr. Paokhosoi Thangsing, graduated from North Eastern Regional Medical College and was a Postgraduate Fellow of the Christian Academy of Medical Sciences trained in Applied Psychology, HIV/AIDS. He has to date dedicatedly worked for over twenty years as a physician, HIV specialist, an activist in the fight for HIV/AIDS. He is the Asia Pacific Bureau Chief of AIDS Healthcare Foundation, United States of America. AHF Asia Pacific bureau operates in Cambodia, China, India, Thailand, Vietnam and Nepal. Michael Weinstein, President - AIDS Healthcare Foundation in his congratulatory message said, "What a great honor. We are all brimming with pride. We don't do this work for the glory, but recognition such as this only confirms the importance of what we do. Lal, on behalf of the entire AHF family, please accept my hearty congratulations. May this medal spur you to new heights of achievement - for when you achieve - so many people benefit. I know that this will be the first of many honors that you will receive for your contributions to humanity." Dr. Chhim Sarath, AHF Cambodia Cares - Country Program Manager said with pride, "This recognition not only honors the leadership of Dr. Chinkholal Thangsing but the entire family of AHF and this is truly an encouraging, inspiring and great motivator. I am very happy and proud for this is a wonderful day for us all in Cambodia. We are highly inspired and we shall do better and be a stronger team.? In 2005, AHF signed a memorandum of understanding (MoU) with the Ministry of Health, National Centre for HIV/AIDS, Dermatology and STI Control (NCHADS) and Ministry of Defence, Preah Ket Mealea Hospital of the Royal Government of Cambodia to collaborate and provide a comprehensive HIV/AIDS treatment, care and support program in Cambodia. Currently, AHF Cambodia Cares operates at 11 sites. The programs focused on technical and financial assistance ensuring the provision of high quality ART treatment and management services and strengthening of continuum of care services, networks and partnership with collaborators and all relevant stakeholders. The sites are Preah Ket Mealea, Kampong Thom, Kampot, Stung Treng, Koh Thom, Romeas Heik, Pea Reang, Kirivong, Ang Roka, Sampov Meas and Oddar Meanchey. Today, this landmark collaborative program provides life saving services including antiretroviral treatment to over 6,000 patients. AIDS Healthcare Foundation (AHF) is the US' largest non-profit HIV/AIDS organization. AHF currently provides medical care and/or services to over 95,000 patients 21 countries worldwide in the US, Africa, Latin America/Caribbean and Asia Pacific. Additional information is available at www.aidshealth.org. AHF Cambodia Cares ART centers provide testing, psycho-social support services and anti-retroviral treatment including both pediatric and second-line treatment. The facilities provide comprehensive HIV/AIDS care and treatment and holistic services, and serve as one-stop shops for people living with HIV/AIDS (PLWHAs). Currently AHF Cambodia Cares serves the Cambodian people through 11 centers and caters over 6,000 people with HIV/AIDS working with NCHADS and other local and international stakeholders. In the Asia/Pacific region, AIDS Healthcare Foundation currently provides free anti-retroviral treatment services to people in need through its clinics in Cambodia, India, Thailand, Viet Nam, China and Nepal. Phnom Penh, Jan 22 (VNA) - Cambodia will introduce draft legislation to better control the use and trafficking of illicit drugs, Cambodian officials announced. If a new draft law is introduced in March, as expected, drug traffickers will receive harsher punishments for possessing smaller quantities of illegal substances, the Phom Penh Post said on Jan. 21. Under the proposed law, drafted by the National Authority for Combating Drugs (NACD) at the Ministry of Interior, individuals found to be in possession of 80 grams of heroin will be given a sentence of life imprisonment. Currently, life sentences are only given to those who are found to be in possession of 100 grams or more. The draft legislation, formulated with the advice of the UN Office on Drugs and Crime (UNODC), will also strive to comply with international drug control laws, including those that apply to prescription drugs that can be purchased over the counter in Cambodia, officials said. Chao Soymala Inieum na Jampasak, 67, shows a tray of her glittering inheritance. 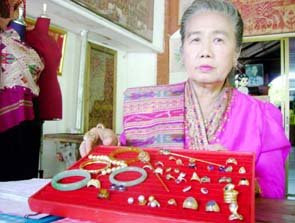 Chiang Mai - A descendant of Laos' Luang Prabang royals yesterday announced she was selling 200yearold silks and jewellery worth Bt30 million to raise funds for monks' education. Chao Soymala Inieum na Jampasak, 67, said she wanted to help cover fees for more than 200 monks from Laos, Cambodia, Vietnam, Bhutan, Nepal and Chiang Tung City to study at Mahachulalongkornrajavidyalaya University in Chiang Mai, her adopted home. Chao Soymala, whose great great grandfather was Phrachao Chaiyachettha, a ruler in the Lan Chang Dynasty, escaped to Thailand as a 30yearold after the Laotian revolution of 1975. After marrying, she settled in Chiang Mai and sold Laotian silks. She is selling 1,000 antique silks decorated with gold and silver threads, some estimated to be worth Bt150,000, as part of a collection that's expected to fetch Bt20 million or more. Centuryold gold ornaments worth about Bt10 million in total are also for sale, she added. Bt600,000 from the sale will go towards the tuition fees. The rest will form a fund to assist monks on dharmastudy missions and to buy clothes for needy female prison inmates, she said. Those interested can contact Chao Soymala at (053) 832 854. COMMUNITIES in Cambodia are living with the constant threat of deadly explosives, the remnants of conflicts since the Vietnam war. RUNNING through the kit list, the inclusion of a hard hat confirms Michela Deegan’s trip to Cambodia cannot be considered a holiday. The self-employed training consultant is heading to one of the most heavily-mined countries in the world. A hard hat would offer little defence against the deadly ordnance but she won’t be taking any unnecessary risks. 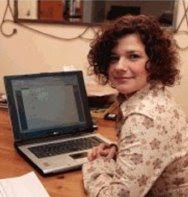 Michela will be working with landmine clearance charity MAG, a world leader in explosives detection. Cambodia is littered with thousands of unexploded landmines. The remnants of conflict from both the Vietnam War and the Cambodian-Vietnamese War lay strewn across the country. They lurk in gardens, fields, parks and trees, threatening communities for years to come. Since 2001 nearly 5,000 Cambodian men, women and children have been horribly disfigured and killed by the weapons of these past conflicts. Michela reached a point when she decided she must help, after hearing motivational speaker Chris Moon discuss his inspiring experience of surviving a blast which took his arm and leg. “He went to work for the HALO Trust, which is a charity like MAG,” explained Michela, 38, of Ings, near Windermere. “He was de-mining in Africa and he stood on a mine which blew off his leg and arm. “He nearly died. But he went on to run 10 marathons to raise awareness, including the Great Sahara Run. “He was such an inspiration and it always stuck in my mind to do something for that type of charity. “Then I was travelling home from London on the train last summer and this expedition was advertised in a magazine. “I thought wouldn’t it be wonderful to do something like that. “But I didn’t do anything about it immediately. “It seemed like a lot of money to raise. I had another think about it in December. “I decided to pay the travel fees myself, so all the other money raised goes straight to the charity. The challenge costs £2,975 per person, of which less than half covers the cost of running the event. Michela has donated to charities in the past – running marathons and swimming the length of Windermere for Marie Curie Cancer Care – but she wanted to go to the root of the problem. “I didn’t want to do an event like trek the Himalayas because you’re not doing anything directly to help. “This is more hands on,” she said. There will be ample opportunity for Michela and the group to get their hands dirty during the challenge. “They will spend four days building traditional Khmer-style houses for the poor and victims of landmines, in temperatures as high as 34C. When she’s not grafting, the rest of the trip will be as strenuous. On the first day there’s a steep 350m ascent to Tapeanh Village, before a trek through the jungle, into villages and past “the Big Buddha” statue that overlooks the whole of the Siem Reap Province. One of the highlights of the challenge is a trek to the UNESCO world heritage site of Angkor Wat. There will be one day in 11 to explore Siem Reap at leisure. Michela has been utilising the Lake District’s fells to build her stamina. “I’ve been doing a bit of walking but my building experience is pretty limited,” she said. “There will be people there to help though. “ The only thing is the heat. It will be really hot and we’ll be working outside labouring. It will be the first time Michela has left her four-year-old daughter Caitlin for any length of time but she’s looking forward to the challenge. “It will be great to see Cambodia because it’s supposed to be beautiful and not as commercialised as Thailand’s become. “The people are supposed to be very warm and welcoming. “They’ve been through a lot in history. It should be some comfort to her husband Jonathan that this will be the first and last time she intends to take on such a challenge. “I’m not planning on doing anything like this again,” said Michela, who was educated at Alfred Barrow School and Barrow Sixth Form College. “It takes a lot of commitment from my family. “They’re having to make a lot of adjustments while I’m away,” she explained. 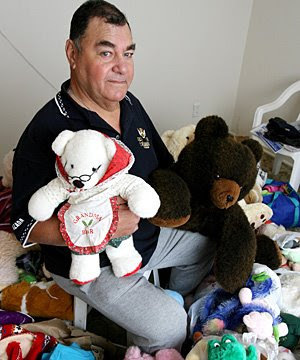 ON A MISSION: Harold Virtue won't give up on getting a 600kg package of gifts to children in Cambodia. If selling his house is what it will take to get a 600kg package of toys, books, biscuits and lollies to sick and orphaned Cambodian children, Harold Virtue will do it. Many North Shore residents responded to Mr Virtue’s call in October for gifts and donations for the children he met while volunteering in a Chamchao hospital and orphanage last year. Mr Virtue says he has received $1000 – enough to freight the packages over – but Cambodian authorities are asking for three times as much to clear the package before it can reach the children. "I don’t have that money," he says. He is also struggling to find someone in Cambodia that he can trust to safely deliver the package, once cleared, to the children. "If I had the money I would go in a second." "It’s really really frustrating. Every day I look at my photos and look at the kids," he says. Mr Virtue says he has already met real estate agents to discuss selling his house. "If that’s the only way to get the gifts to the children then I’ll do it." He says he has been in contact with the nuns at the orphanage who are looking forward to receiving the gifts, new or second hand. "All I want is for the children to get them." To make a donation to help Mr Virtue or be of assistance call him on 486-7022. Health officials have tested at least 140 people for the avian influenza, following the discovery of the disease in one man late last year, but all of them have tested negative, officials said. Authorities had feared they were exposed to the virus by eating or handling contaminated poultry in Doeum Russ commune, Kandal Stung district, Kandal province, where Cambodia’s only 2008 case of bird flu appeared in December. Leng Khan, chief Doeum Russ health center, told VOA Khmer recently that blood tests for the H5N1 virus, known as bird flu, was a protective measure for the health of the commune’s residents. Dy Soeum, a veterinarian in the commune, said he was glad the blood tests had developed into a strong campaign to fight the virus for villagers. Villagers had been very concerned about the disease following an initial diagnosis in one man from Doeum Russ, Teng Sopheak, 19, who was hospitalized in December after eating contaminated poultry in November. Pok Nhem, a 40-year-old neighbor of Teng Sopheak, who had helped clean and cook the chickens Teng Sopheak ate, said he was relieved to be found negative for the virus. He did not eat any of the potentially contaminated chicken, but he was still worried he might have contracted the disease. Khem Saem, a 55-year-old farmer, was tested with three members of her family, because she had taken Teng Sopheak to the hospital when he fell ill and subsequently visited him there. “I just now know about the spread of bird flu,” she said. The doctor gave her son, who had also handled chickens, Tamiflu anti-viral treatment, along with others that were directly involved with the local poultry. At least five Khmer Krom monks have been released from prison in recent months, but their movements have been restricted, according to the Cambodian organization the Khmer Kampuchea Krom Community. Thach Setha, president of the Khmer Kampuchea Krom Community, appealed to the United Nations and the European Union, as well as the new administration in the US, to take additional measures to pressure the Vietnamese government “to respect the rights” of Khmer Krom and other indigenous people. Ly Son was released Nov. 23, 2008; Kim Moeun, Danh Toan and Thach Thoeung were released Jan. 18; and Ly Hoang was released Tuesday, according to the group. However they have been “prohibited” from being reinstated as monks, despite official requests, the group said. “The underlying problems faced by the Khmer Krom in Vietnam still remain,” he said. Human Righs Watch on Wednesday issued a full report on abuses of Khmer Krom, a minority group in Vietnam with cultural ties to Cambodia. “Wary about possible Khmer Krom nationalist aspirations, Vietnam has suppressed peaceful expressions of dissent and banned Khmer Krom human rights publications,” the group said in a statement. Vietnam Embassy officials could not be reached for comment. Cambodia’s younger generation still lacks information on both the Khmer Rouge regime and the government-UN tribunal established to try its leaders, according to a recent survey by a US university. Between September and October last year, the Human Rights Center of the University of California Berkeley conducted a survey of 1,000 Cambodians aged 18 and above. “What we realized is that among the younger ones, among people who were not born during the Khmer Rouge regime, 80 percent of them tell us they know nothing or they know very little about the Khmer Rouge regime,” said Patrick Vinck, director of the Initiative on Vulnerable Populations at UC Berkeley and one of the authors of the survey. The survey, titled “So We Will Never Forget,” was conducted in 250 villages across the country. It found that the majority of people interviewed had confidence in the justice and neutrality of the Khmer Rouge tribunal, which was set up in 2006 and is preparing for its first trial, of prison chief Duch, in coming months. However, about a third of those surveyed said the court was not neutral, and about 23 percent were “interested” in corruption within the courts. The majority of those interviewed said they did not approve of Khmer Rouge leaders living among their communities; 71 percent wanted to see Khmer Rouge members condemned; and one third wanted revenge for atrocities of the past. BY REINHARD HOHLER, ETN STAFF WRITER JAN 20, 2009According to media sources in Phnom Penh, the Center for Advanced Study (CAS) has announced a release of the first book about the history of ethnic minority groups in Cambodia. The 664-page book examines the lifestyles and cultures of Cambodian residents of Chinese, Vietnamese, Thai and Laotian descent, as well as members of Muslim and other minority communities, CAS director Hun Sokhom was quoted by the Phnom Penh Post as saying. "We hope the book will help Khmer people better understand the traditions and cultures of each ethnic group," Hun Sokhun said, adding that he believed that widespread distribution of the book will reduce discrimination directed at minority groups. The book is based on two separate studies carried out by Khmer and foreign experts - a three-month study by the United Nations in 1996, and a 12-month study in 2006, paid for by the Rockefeller Foundation, according to the newspaper. Phnom Penh - A report released in Cambodia on Wednesday said 85 per cent of Cambodians had little or no knowledge of the UN-backed tribunal currently putting former Khmer Rouge on trial. According to the survey - which was conducted by the University of California's Human Rights Centre in September and October - 39 per cent of respondents said they had no knowledge about the tribunal, while 46 per cent said they had 'a little' knowledge about the court. The findings led the report's authors to call on the Cambodian government, the tribunal and non-governmental organizations to improve their public awareness campaigns. 'One of the main objectives of this report is to ensure victims of the Khmer Rouge are given voice and are brought to the table in the trial process,' co-author Eric Stover told media at the report's launch in Phnom Penh. 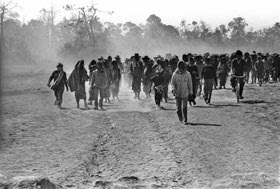 The survey put a range of questions about the Khmer Rouge and the tribunal to 1,000 randomly selected Cambodians is all the country's provinces. The report recommended that the government and the tribunal immediately investigate and resolve allegations of corruption on the Cambodian side of the court, which surfaced last year, and appoint a public education officer to the court. 'This data shows that 15 per cent of respondents had a moderate or higher knowledge of the tribunal, so it could also be understood as showing that 61 per cent had at least some knowledge,' she said. 'This also contradicts an International Republican Institute report that 72 per cent of people had knowledge about the court,' she added. The Khmer Rouge tribunal was established in 2006 after a decade of negotiations between the Cambodian government and the UN. Five former Khmer Rouge leaders are facing trial for their roles in the deaths of up to 2 million people though execution, starvation and overwork during the ultra-communist regime's rule between 1975 and 1975. On Monday the court announced the long-awaited trial of former S-21 torture facility chairman Gaing Kak Ev - known by his revolutionary name, Duch - would begin on February 17. No dates have been set for the four other detainees' trials. For $25, you can sail down Cambodia’s Tonle Sap lake and river system. Angkor Wat, the famous abandoned temple complex in the jungles of northern Cambodia, is fast becoming one of the world's greatest tourist destinations. Planes fly hourly from the capital of Phnom Penh and soon there will be direct flights from Japan. However, those wishing to save a bundle on the over-priced airfare have options; the buses are fairly safe, although the roads are insane. Or you can take the fast ferry down the lake. 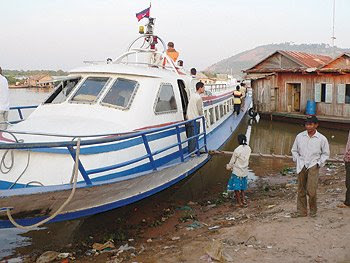 At $25 one-way, it's only rich Westerners who can afford a ticket down the vast Tonle Sap, almost 180 miles to Phnom Penh. On this day, the 120 seats of the main cabin were full and the roof packed with tourists keen for an adventure. So, yes, we were well over capacity but in Cambodia it's not like there's anybody in charge of such minor things. About 30 minutes into the trip, the horizon disappeared and the dazzling blue waters of the huge waterway stretched into the distance. The rainy season was over and the vast lake was completely full of water, fish and crocodiles. The great speed we were making seemed to allow water to creep into the cabin. Crammed in like sardines, we grinned at this small annoyance, just one of those situations that make developing countries so charming. I then noted with some alarm that some passengers were casually putting on life jackets. The water by this time was over our ankles amidships, and even deeper at the back. Two elderly ladies in the seat front started crying, and then everyone stood up and tried to put on life jackets. As the ferry turned, water sloshed back and forth and the boat made slow sickening slides. It became obvious that it was necessary to find the source of the water immediately because we were listing so heavily. Looking out the window I noticed the crew had secured life jackets for themselves and were ready to jump overboard at any moment. Some of us then told the captain to jump overboard, with strict order to locate the source of the leak. A very slim passenger went down into the muck of the bilges and found the leak, a hole the size of a soccer ball punched through the hull just below the waterline. All three compartments in the hull were completely saturated with water. This is when we discovered that not only were the life vests useless but there was no rear exit, no life rafts, all the windows were welded shut and the bilge pumps did not work. A perusal of my Lonely Planet explained there were two fast ferries that plied the waters of the Tonle Sap, one of which actually ran on a somewhat regular basis; the other was known as "The Floating Coffin" for its sad state of disrepair. Evidently, from time to time, various bits and pieces like the propeller would fall off the Coffin and the crew would be required to hail passing fish boats for rescue, although the boat didn't usually sink. Several volunteers formed a water bucket line, and soon six strong men were throwing five-gallon buckets of water overboard, using an old paint can rousted from the engine room. At the rate of one bucket every 10 seconds, we bailed several tons of water over four hours. We finally got a small portable water pump going, and soon a steady waterfall of bilge water erupted over the side of the boat. All the time the bucket crew were bailing, the captain had been banging away with a hammer at the hole, a most disconcerting sound inside a crowded metal boat. Finally, one of the passengers grabbed the hammer and went down into the bilge armed with a fistful of T-shirts and some donated rubber sandals. The hammering and bailing continued for several hours as we slowly proceeded, but the T-shirts did the trick and we somehow stayed afloat. Finally, we approached a small town and a police boat came out to meet us. Conjecture began; would the boat be impounded and certain people arrested along with it? Whom, exactly? Those of us involved in the mutiny discussed our options. The prospect of spending quality time with the local gendarmes weighed heavily upon my stomach, so I headed directly for the loo where I performed emergency business. Searching my pockets desperately for paper, all I could find was my fast ferry ticket so I made good use of it; a rough day under trying circumstances to be sure, but the job's never really over until the paperwork is done. We jumped into a decrepit taxi idling at the dock, grabbed a six pack of cold beer, and fled 100 miles to Phnom Penh, toasting the fact that we were still alive while discussing our next adventures in Southeast Asia. It was mutually agreed that Cambodian boat captains or crocodiles would not be part of future transportation arrangements. In Phnom Penh, I met with the editor of the Cambodia Daily, who thought our adventure constituted an excellent story and promised to publish it the following week, thoroughly embarrassing the government while allowing us enough time to flee the country. In Cambodia, it's not like there are people in charge of such minor things as boat sinkings, but sending 125 foreign tourists to the bottom of the Tonle Sap does make for bad publicity. Phnom Penh, as it turned out, was a lovely city full of French colonial architecture and well worth visiting. The cuisine is French-influenced with Thai and Vietnamese flavours. Flights from Bangkok and Hong Kong are regular, although of course if you are heading up to Angkor Wat you can always take the fast ferry to save a few dollars. leaders, journalists, union leaders, Buddhist monks and artists. The recent subterfuges by the Royal Government Intelligence Bureau Q101under the order of Prime Minister HUN SEN and under the direct executive order of General MOL ROEURP have staged up the arrest of four people “suspected” of two foiled bomb plots in the city. But in reality, all those four people are active officers of the Bureau Q101. This stage aims to sap the moral of the opposition and democratic activists. 1993 to these days the assassins and groups of people behind the scene who ordered the assassination of political leaders, journalists, union leaders, Buddhist monks and artists were never arrested and put to trial. 1. Mr. THUN BUNLY Director of the Cambodian journal Khmer Ideology, supporter of SAM RAINSY Party was assassinated in 1995. 2. 19 union activists were killed and more than 160 people injured during the grenade attack on March 30, 1997 in front of the National Assembly. 3. Mr. HOU SOK, Secretary of State of Interior was killed in the building of Ministry Interior and his several collaborators were murdered during the coup of July 1997. 4. Ms. PISSITH PILIKA artist and professor at the University of Fine Art was assassinated on August 6, 1999. 5. Buddhist monk Ven. SAM BUNTHOEUN was murdered on February 6, 2003. 6. Mr. OUM RASADY was assassinated on February 18, 2003. 7. 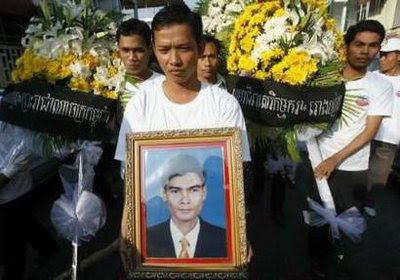 Mr. CHOU CHETHARITH, Ta Prum Radio’s reporter was assassinated on October 19, 2003. 8. Miss TOUCH SREYNICH, star singer, was crippled and her mom murdered on October 21, 2004. 9. 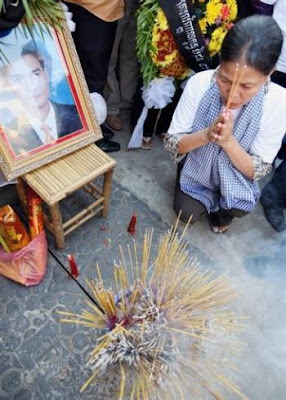 Mr. CHEA VICHEA, union leader, was murdered on January 22, 2004. 10. Mr. ROS SOVANNRETH, union leader, was assassinated on August 11, 2004. 11. Mr. YIM SAMBO, journalist of Cambodian journal “Khmer Conscience” and his son were murdered on August 11, 2008. 12. Political Activists supporters of the Opposition were murdered. Human rights activist, defense of territorial integrity activists, and news reporters such as Radio Free Asia reporter’s LEM PISETH, all have received death threat. The Cambodian Action Committee for Justice & Equity (CACJE) believes firmly that the Royal Government must according to the constitution assure and protect the fundamental rights of the people, the individual security rights, political rights, activists rights, union rights and render justice for the victims and their families. Therefore, the assassins and those who ordered the assassination must be arrested and punished according to their crime. The family victims, the victims and the international community don’t want to see the assassins and those behind scene who ordered the assassination lived free untouchable by the justice. As acting Prime Minister, and as Minister of Interior you have all the responsibility of the police, the Cambodian Action Committee for Justice & Equity (CACJE) requests your Excellence to arrest all the assassins and those behind the scene who ordered the assassination in order to put them all on trial and punish accordingly to their crimes by the Court of Justice. A highlight of this year’s Mardi Gras Festival will also benefit a worthy cause, actors Joy Smithers and Andrew McFarlane tell Peter Hackney. When Australian screen and stage veteran Joy Smithers caught up with SX in June last year, she was promoting a charity with which she is heavily involved: Hope for Cambodian Children, a facility for HIV-positive orphans in Cambodia’s Battambang province, established by Midnight Shift owner and former AIDS Trust of Australia governor, Tim Berry. Fast forward to today and Smithers is again appealing to the community to support the project – but this time with a twist. On Friday, February 20, Sydneysiders can assist just by having a great night out at the theatre: Smithers has teamed up with fellow actor Andrew McFarlane, director Zoe Carides and producer Mark Eldridge to present a production of A.R. Gurney’s Love Letters at the Factory Theatre, Enmore, as part of the 2009 Sydney Gay and Lesbian Mardi Gras Festival. All money raised will go directly to the Hope for Cambodian Children Foundation. Smithers, best known for long-term stints on All Saints and Home and Away, her role with Nicole Kidman in Bangkok Hilton, and a raft of stage productions, says that not only will theatregoers be supporting the cause, but they’ll be treated to “a beautiful story” too. McFarlane, Smithers’ love interest in the play, is equally enamoured of the production. “It’s a beautiful piece,” he agrees. “It’s unique in that it’s not performed as a normal play. It’s two actors behind two separate desks and they communicate with each other and to the audience by reading the letters aloud. They’re either reading a letter they’ve received or reading one they’re sending to the other. Like Smithers, McFarlane is pleased to be performing a work which benefits Hope for Cambodian Children – and feels particular resonance with the HIV/AIDS cause as a gay man who’s lost friends to the disease. 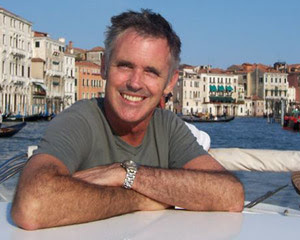 The star of Australian dramas The Sullivans and The Flying Doctors, soon to appear in the new series of Underbelly, recalls being in his late twenties and early thirties when HIV/AIDS first struck these shores. “Friends and acquaintances started getting infected or in fact, dying ... In those early days it was so dramatic because people had no idea what to do,” he recalls. “It’s satisfying to be able to use my craft to help people affected by this disease,” he muses. Smithers adds that, as Australians, we have a moral duty to help people suffering on our doorstep in less fortunate countries. “I’ve spent many beautiful holidays over the years in Asia and I just think, ‘Come on, Australia! You can’t just go over there and enjoy their beaches, and the cheap airfares and food – you’ve gotta give something back! A man called Jean-Jacques Gandini, an associate professor in French Literature, found himself standing before the Khmer Rouge Tribunal on November 26th last year, and was asked to answer for his verbal assault of public officials in the course of their duty... A much incongruous trial, held in premises intended for the hearings of senior leaders and criminals of Pol Pot's regime. The mock trial, performed by lawyers from the Montpellier Bar Human Rights Institute (in the South of France) was used as a test-trial, which turned out to be successful, to check the functionality of courtroom technical equipment but most importantly, to give an example of the French legal system, based on Romano-Germanic Law (Civil Law), but also of the Cambodian system which prevails within the Extraordinary Chambers in the Courts of Cambodia (ECCC), right beside International Law, elaborated on the basis of the Anglo-Saxon system (Common Law). Two legal systems, a single court... quite a headache for whoever deals with the mix. The Gandini case is based on a real trial, conducted under the principles of Criminal Law, and was examined by the Montpellier Criminal Chamber a few years ago, in which the Defence lawyer was actually François Roux, the French co-Lawyer for Duch, the former director of the S-21 torture centre, first on the list of the Khmer Rouge trials before the ECCC. 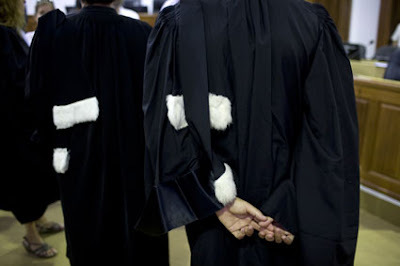 However, the rules of French Law for the case procedure were slightly bent - and authorised - for the occasion so as to add to the impact of the trial within the ECCC: a “protected” witness was thus added, and his/her identity was concealed and protected. The French lawyers, who are none other than Francois Roux's colleagues from the same Bar, happily stood in the shoes of the different parties present at the trial. The case: Events happened in the defendant's hometown, in the evening - to justify his intervention as the police proceeded to what he thought was an unfairly tough way of taking people in for questioning, a professor, speaking with composure and poise, pleads the state of lawful rebellion on the part of a citizen. He denies the charges pressed against him by three policemen, alleging he hurled insults at them. The defendant is discharged. In a matter of seconds, the “actors” left their part and went back to sit among the audience, mainly composed of Cambodian Law students and ECCC personnel. After the practical demonstration, the debate was opened. The aim, as explained, is not to “give a lesson” but to “take part in a common reflection”: how can different legal systems possibly work together?” Between Civil and Common Law, “the one is just as good as the other”, and the ECCC, basing its fundamental system on both, must therefore “invent something together”. The initiative was launched by the ECCC Defence Support Section (DSS), led by its acting head Richard Rogers. The hybrid court, established in Phnom Penh, has now been operating since 2006 but the union of the two legal systems still raises questions on both sides. “The new Criminal Procedure Code of Cambodia (CPC) came into force in the country during the summer 2007 and is based on the French Penal Code. This gave rise to the idea of a mock trial organised along the lines of Civil Law”, Richard Rogers explains, pointing out that several elements of International Law, like the protection of witnesses, will be added to Civil Law in the ECCC. For him, “there is no fight” between those guided by Civil Law principles and those rather based on the Common Law system, but just a group of people “coming from different backgrounds, who think together to see what works best for serious cases coming under the responsibility of an International Criminal Court, within Cambodian context”. The French co-Lawyer for Duch reckons that “International Criminal justice deserves trials to be held “within a reasonable amount of time”. “Here, we have the opportunity to test a system other than what is followed by other International Criminal Courts, so let's test it! In the end, we will obviously see whether it is better, not better, or worse! But if we notice that with that adaptation of both systems, we really do improve the length of these trials, then I think everyone will come off better.” The hard challenge, he continues, lies in “the way that we, today, can build up a new international Criminal Law system to allow trials to be held within reasonable periods of time, and trials which civil parties will attend and take part in, trials in which the defendant – and this is my wish here – will always be allowed to speak last”. Does Cambodian procedure have to have the last word? In the Preamble to the Internal Rules , the ECCC indeed explain that the purpose of the document is “to consolidate applicable Cambodian procedure for proceedings before the ECCC and […] to adopt additional rules where these existing procedures do not deal with a particular matter, or if there is uncertainty regarding their interpretation or application, or if there is a question regarding their consistency with international standards”. However, in practice, this calls for several interpretations. On many occasions, during Pre-Trial Chamber hearings, parties disagreed on the question as to whether the court should be guided by Cambodian procedure or rather refer to the ECCC Internal Rules. Thus, on February 25th 2008, the Defence Team for Nuon Chea appealed against the Order refusing the Request for Annulment by the Office of the co-Investigating Judges (OCIJ), claiming that Cambodian procedure, i.e. the Criminal Procedure Code of Cambodia (CPC) had priority in this case. Co-Lawyers for the civil parties then decided to deal with the issue by supporting, in form rather than substance, the argument of the Defence. They called the pre-Trial Chamber to reconsider its decision dated August 28th 2008 regarding the relationship between the Internal Rules and the CPC, and stated that the latter must constitute the primary instrument in the proceedings, before the Internal Rules. Indeed, the pre-Trial Chamber (PTC), emphasising the exceptional context of the ECCC, asserted that the Internal Rules constituted “the primary instrument to which reference should be made in determining procedures before the ECCC where there is a difference between the procedures in the Internal Rules and the Criminal Procedure Code”. The PTC then considered that “the provisions of the CPC should only apply where a question arises which is not addressed by the Internal Rules”. It is true that at the time of the adoption of the Internal Rules in June 2007, the CPC was not effective yet – it came into force in August 2007 – but, as pointed out by lawyers for civil parties, “the draft of the CPC, which was very similar to the ultimately enacted law, was already available”. They added that the CPC had already been adopted by the National Assembly during the June 2007 plenary session. Silke Studzinsky, the German lawyer for the civil parties at the ECCC, claims that the Criminal Procedure Code of Cambodia should be implemented in accordance with the Agreement between the United Nations and Cambodia, and with the ECCC Law and quotes Article 33 (new) of the Law on the establishment of the ECCC: “If the existing procedures do not deal with a particular matter, or if there is uncertainty regarding their interpretation or application or if there is a question regarding their consistency with international standard, guidance may be sought in procedural rules established at the international level”. 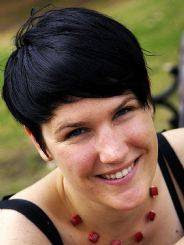 By emphasising this aspect, Silke Studzinsky questions the legitimacy of the Internal Rules, drafted by her judiciary personnel during the plenary session(* ), which, she points out, was not subjected to any vote at the National Assembly of Cambodia. Thus, she suggests the question of hierarchy of rules and rights within the hybrid court be closely looked at again. “The plenary session has no authority over the adoption of the Internal Rules which represent an independent system of legal procedure. However, in Cambodia, the National Assembly alone holds legislative power. Neither the Agreement establishing the ECCC nor the ECCC law delegate such legislative power to the plenary session. Even if the Internal Rules are valid, they come under the Criminal Procedure Code of Cambodia”, the lawyer details, reminding that practices are much different in International courts like the ones in Rwanda, Sierra Leone or former Yugoslavia, where a provision was created to allow judges to adopt their own procedural rules. * Participants at the plenary session: co-Investigating Judges, Judges of the Chambers, co-Prosecutors, the director of the Defence Support Section, head of the Victims Unit, head and deputy head of the ECCC Office of Administration. However, as stipulated in Rule 18 (3b) of the Internal Rules, only the co-Investigating Judges and Judges of the Chambers are entitled to vote on therules contained in Chapter III (Rule 21 to 114) regarding the procedure. (New York, January 21, 2009) - The Vietnamese government should immediately free Khmer Krom Buddhist monks and land rights activists in prison or under house arrest for the peaceful expression of their political and religious beliefs, Human Rights Watch said in a report released today. The Khmer Krom is a large ethnic group in the Mekong Delta that is central to Vietnam-Cambodia relations. The 125-page report, "On the Margins: Rights Abuses of Ethnic Khmer in Vietnam's Mekong Delta," documents ongoing violations of the rights of the Khmer Krom in southern Vietnam and also abuses in Cambodia against Khmer Krom who have fled there for refuge. Wary about possible Khmer Krom nationalist aspirations, Vietnam has suppressed peaceful expressions of dissent and banned Khmer Krom human rights publications. It also tightly controls the Theravada Buddhism practiced by the Khmer Krom, who see this form of Buddhism as the foundation of their distinct culture and ethnic identity. "Vietnam's response to peaceful protests provides a window into the severe and often shrouded methods it uses to stifle dissent," said Brad Adams, Asia director at Human Rights Watch. "The government should be trying to engage in dialogue with the Khmer Krom, rather than throwing them in jail." "The official documents we publish today lay bare the efforts by the Vietnamese government to silence critics," said Adams. "This is bare-knuckled, indefensible political repression." 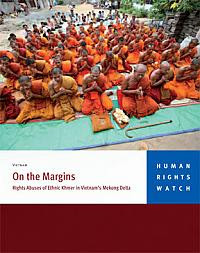 "On the Margins" provides a rare, in-depth account of a protest conducted by 200 Khmer Krom Buddhist monks in Soc Trang province, Vietnam, in February 2007. Protesters called for greater religious freedom and more Khmer-language education. Although the protest was peaceful and lasted only a few hours, the Vietnamese government responded harshly. Police surrounded the pagodas of monks suspected of leading the protest. Local authorities and government-appointed Buddhist officials subsequently expelled at least 20 monks from the monkhood, forcing them to defrock and give up their monks' robes, and banishing them from their pagodas. The authorities sent the monks back to their home villages and put them under house arrest or police detention, without issuing arrest warrants or specifying the charges against them. During interrogations, police beat some of the monks. In May 2007, the Soc Trang provincial court convicted five of the monks on charges of "disrupting traffic" and sentenced them to two to four years of imprisonment. Some of the monks were beaten during interrogation. After the demonstrations, the authorities instituted stricter surveillance of Khmer Krom activists, restricted and monitored their movements, banned their publications, and monitored their telephones. The report also examines rights abuses of Khmer Krom who have moved to Cambodia, where they remain among Cambodia's most disenfranchised groups. Because they are often perceived as ethnic Vietnamese by Cambodians, many Khmer Krom in Cambodia face social and economic discrimination and unnecessary hurdles to legalizing their status. "The killing, imprisonment, and defrocking of Khmer Krom monks sends a chilling message to Khmer Krom activists in both Cambodia and Vietnam," said Adams. "An ethnic group that should enjoy the protection of two countries finds itself stripped of protection by both."